NEGRIL, Jamaica, Aug 24 2017 (IPS) - Ceylon Clayton is trying to revive a sea moss growing project he and friends started a few years ago to supplement their dwindling earnings as fishermen. This time, he has sought the support of outsiders and fishermen from neighbouring communities to expand the operations and the ‘unofficial’ fishing sanctuary. Clayton is leading a group of ten fishers from the Little Bay community in Westmoreland, Jamaica, who have big dreams of turning the tiny fishing village into the largest sea moss producer on the island. To protect their ‘nursery’ and preserve the recovery, the fishermen took turns patrolling the bay, but two years ago, they ran out of money. He is also one of the many thousands of fishers in the Caribbean who are part of an industry that, along with other ecosystem services, earns around 2 billion dollars a year, but which experts say is already fully developed or over-exploited. The men began farming seaweed because they could no longer support their families fishing on the narrow Negril shelf, and they lacked the equipment needed to fish in deeper waters, he said. As Clayton tells it, not long after they began enforcing a ‘no fishing’ zone, they were both surprised and pleased that within two and a half years, there was a noticeable increase in the number and size of lobsters being caught. “When we were harvesting the sea moss we noticed that there were lots of young lobsters, shrimp and juvenile fish in the roots. They were eating there and the big fish were also coming back into the bay to eat the small fish,” Clayton told members of a delegation from the German Development Bank (KfW), the Caribbean Community Climate Change Centre (CCCCC) also called 5Cs and the International Union for the Conservation of Nature (IUCN) who came to visit the site in May. “We didn’t have the markets,” Clayton said, noting there were limited markets for unprocessed seaweed and not enough money to support the patrols. The seaweed is thriving and teeming with marine life; fishing in around Little Bay and the neighbouring villages has also improved, Clayton said. Now he, his wife (also a fisher) and eight friends want to build on that success and believe the climate change adaptation project being implemented by the 5Cs is their best chance at success. They’ve recruited other fishers, the local school and shopkeepers. Showing off the variety of juvenile marine animals, including baby eels, seahorses, octopi, reef fish and shrimp hiding among the seaweed, the 30 plus-years veteran fisherman explained that the experiment had shown the community the success that could come from growing, processing and effectively marketing the product. The bonus, he said, would be the benefits that come from making the bay off-limits for fishing. This alternative livelihoods project is one of many that make up the 14 coastal protection projects being implemented across the region by the 5Cs. Aptly named the Coastal Protection for Climate Change Adaptation (CPCCA) in Small Island States in the Caribbean Project because of its focus, it is being implemented with technical support from IUCN and a €12.9 million in grant funding from the KfW. “The project seeks to minimise the adverse impacts from climate change by restoring the protective services offered by natural eco-systems like coastal mangrove forests and coral reefs in some areas, while restoring and building man-made structures such as groynes and revetments in others,” the IUCN Technical consultant Robert Kerr said in an email. Aside from Jamaica, Grenada, Saint Lucia and St. Vincent and the Grenadines are also beneficiaries under the project. The Caribbean is heavily dependent on tourism and other marine services, industries that the Inter Governmental Panel on Climate Change’s (IPPC) last report indicate are expected to be heavily impacted by climate change. Most if not all states depend on the fisheries and the regional tourism industry – which grew from four million visitors in 1970 to an estimated 25 million visitors today – earns an estimated 25 billion dollars in revenue and supports about six million jobs. “The project is a demonstration of Germany’s commitment to assisting the region’s vulnerable communities to withstand the impacts of climate change,” said Dr. Jens Mackensen KfW’s head of Agriculture and Natural Resources Division for Latin America and Caribbean. All the Jamaican projects are in protected areas, and are managed by a mix of non-governmental organisations (ngos), academic and local government organisations. 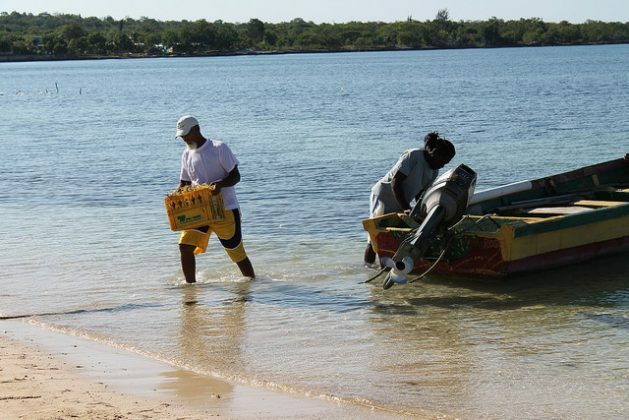 The Westmoreland Municipal Corporation (WMC) is managing the seaweed project and two other components – to reduce the flow of sewage into the wetlands and install mooring buoys and markers to regulate use of the sea – that focus on strengthening the ecosystem and improving the climate resilience of the Negril Marine Protected area. The University of the West Indies’ Centre for Marine Sciences is managing the East Portland Fish Sanctuary project; the Caribbean Coastal Area Management (C-CAM) Foundation works in the Portland Bight area and the Urban Development Corporation (UDC), a quasi-government agency is managing infrastructure work on the Closed Habour Beach also called Dump Up beach in the Montego Bay area. Clayton’s plan to include a processing plant at the local school and a marketing network in the small business community has impressed 5C’s executive director Dr. Kenrick Leslie and McKensen. In Portland Bight, an area inhabited by more than 10,000 people, and one of the most vulnerable, C-CAM is working to improve awareness, build resilience through eco-systems based adaptation, conservation and the diversification of livelihoods. Important, CCAM Executive Director Ingrid Parchment said, because most of the people here rely on fisheries. The area supports some 4,000 fishers – 300 boats from five fishing beaches. They have in the past suffered severe flooding from storm surges, which have in recent times become more frequent. And in the tourist town of Montego Bay, the UDC is undertaking structural work to repair a groyne that will protect the largest public beach in the city – Dump-up or Closed Harbour Beach. Works here will halt the erosion of the main beach as well as two adjacent beaches (Gun Point and Walter Fletcher) and protect the livelihoods of many who make their living along the coast. When complete the structure will form the backbone of further development for the city. UWI’s Alligator Head Marine Lab is spearheading a project to reinforce protection of vulnerable seaside and fishing communities, along the eastern coast of Portland, a parish locals often say has been neglected but with links to James Bond creator, Ian Fleming it has great potential as a tourism destination. Here, over six square kilometres of coastline is being rehabilitated through wetlands and reef rehabilitation; the establishment of alternative livelihood projects; renewable technologies and actions to reduce greenhouse gases and strengthen climate resilience. In St Vincent and the Grenadines, the CPCCA is helping the Ministry of Works to rehabilitate the Sandy Bay Community, and the coastal Windward Highway where storm damage has caused loss of housing, livelihoods and recreational space, Kerr said. CPCCA is well on its way and will end in 2018, by that time, Leslie noted beneficiaries would be well on their way to achieving their and the project’s goal. Good article in the context of climate change. Sharing of experience from coastal regions about climate resilient practices is of great importance.